Lorelei looking back at your male snap plate placement. Something to keep in mind, the more space you have between snap mounts (between sections) generally leads to these sections overlapping one another just standing there or during troops. Oof. Good to know, Tony. I thought maybe if they were right on either side of the seam that would cause problems of its own. Hopefully my armor will be so well shaped and fitted to me that it will have no desire to slide about, but if it does now I know how to fix it. Thanks! Speaking of strapping, I finally got the sew-in snaps for the shoulder-nylon to shoulder-bell-elastic connection just now. I did NOT expect #10 snaps to be as ungodly huge as they are! Guess they'll keep flat well enough. Boy. I have yet to revisit the chestplate positioning issue so I can't sew them in just yet, but I think (peering into empty wallet with hand drawn moths comically fluttering out of it) I have actually purchased all I need for my TK now. ...minus further helmet electronics. Though I've already got a bunch of those. But that's a song for another time. Merry belated Christmas, y'all, now go eat those leftover cookies! Wait wait wait, please - offset how? I've been digging around and can't find any specific sew-in snap placement. I figured I'd just put it in the middle of the (nylon) shoulder strap. Offsetting the snap in the white elastic is a good thing because it provides more stability/strength for the connection. 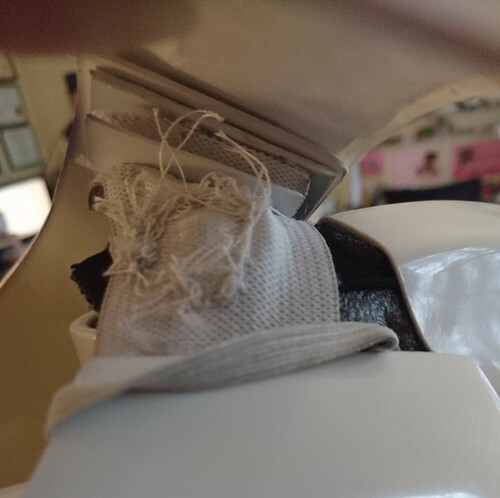 In the pic below, you're looking at the white elastic as seen from under the plastic shoulder strap from the back. This is the right shoulder, BTW. My elastics are more narrow than most TKs, and that's because I had to narrow the chest/neck and shoulder areas. The wider elastic would have been visible if I'd gone with the usual stuff. Anyhow, you want to keep your snaps in as close to the inside (towards your neck) as possible. This will help prevent your elastics at the shoulders from sagging due to the pulling of the arms. Did I get that right, Tony? Ohh - thank you! Tony's is probably one of the build threads I should've printed out for easier consultation. Out of curiosity, in your picture, what's the black material secured there for? That's the elastic that holds the shoulder bell to the shoulder strapping. One half of the size 10 snap is sewn into the white elastic. The other half of the snap is sewn into the black elastic strap. The other end of the black elastic strap is glued directly into the shoulder bell. Hope that helps! Gotta love a Horshack reference. looked like leather or something bridging the shoulder gap beyond the elastic further around the arm, perhaps to hide the end of the neck seal bib or something was my thought. Must just be the lighting! Return to your homes. Nothing to see here. Haha! That's just some extra foam padding on my mannequin. It gives more support to the armor when it's on display. When you kicked off this build at Jonathan's house back on Labor Day weekend, I commented that he would finish quick ("blessed" with Joe Average TK build), but that your build had potential to be the stuff of legend. So far, both of those are playing true to forecast! You are doing awesome! When you are ready for The Show, please post (here or PM or Carida forums) where your first troop will be. I would love to be on hand when you go "live". Thank you, @gatetrooper ! I'll most definitely let you know. I'd love for the first set of TK armor I got a good look at to be on hand for my debut too. It's been quite a ride and it's not over yet, but I'm enjoying it regardless! Though how quick Jonathan's build was does make me a *smidge* jealous, yes. Okay, folks. Maybe not radio silence, but it's been video silence (visual silence? visual blindness? I'm trying here) long enough. PICTURES! And then questions. Down below. But first, a progress check-in! Last night I brought all my limb armor into the living room, piled it in front of the couch, and put on movie after movie to keep my brain occupied (quite a task at the best of times) while I cleaned every. last. cover strip seam. which may look like danger-claws but are in fact commonly known as roofer's blades and fit in any normal utility knife. They let you cut materials by pulling more than pressing down through the material (and consequently scoring whatever's behind). They're downright magical. Invest, y'all. I still had to clear the glue off of the upper bit of the strip and get the seam really clean which took for-ever but hey, it's done now. My ab closures are now almost ready, too! Tab on one side. Han snap is purely decorative. Half of the closure is also my kidney splice reinforcement. Still have to make elastics, put back the part of the bottom edge that snapped when making kidney notches, and bend the tab inwards some. I admire those of you that chose flexible tabs. Brains, foresight, etc. Other side is looking half happy too. Hinge is a la @A.J. Hamler (again). However after gluing the elastic behind the ABS strips vertically, I discovered my woven elastic wouldn't stretch at all, so while it was still a hinge, it had no stretch. Stretch was a priority for me due to fear for the safety of the rivet holes. So I yanked and tugged and peeled it off and glued three pieces horizontally instead and now it does stretch a tiny bit! Yay. I also glued thin pieces of pre-vac-formed ABS behind each hole before mounting the hinge with only rivets and washers. Side note: my rivets were too short and @ukswrath swooped in to the rescue. Woo! Thanks, Tony! My belt is looking rather belt-like. Got the Velcro installed now that I could size it. Made the Velcro narrow enough to fit between the TD/O2 canister brackets as it gets rather thick otherwise. The belt is reinforced with "plastic canvas" throughout (minus ends), and the plastic belt is riveted on in the center only pending snap attachment of the canvas to ab. assembled according to Cricket's instructions. Highly recommend. Cool. Good talk. Now the queries. Q1. My forearms are stupid. How would y'all recommend I treat that height difference up top? 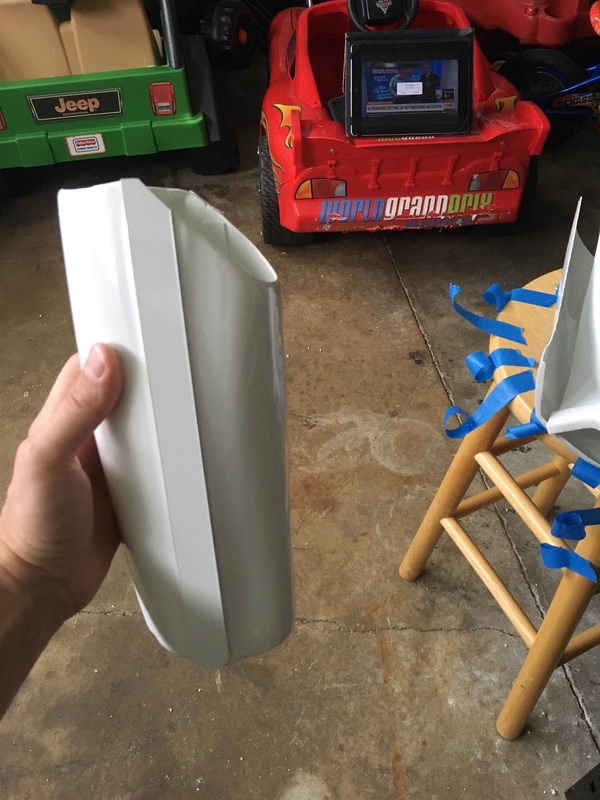 Angle the cover strip, taper the whole thing? Q2. In some places, my cover strips do not lie perfectly flat. How noticeable is this actually while oot and aboot trooping, and do I need to deal with it? Q3. Am I correct in drawing the apparent trim line on the trooper on the right? The inside of the knee is hard to find pictures of. Q4. Do you think, if I just trimmed the ends vertically, I could leave the knee where it is? No worries if not. Whoa, check this out. In rereading my post I was like "why on earth does the Han snap have a female back, did I have the wrong dies in my press" and then I went and got my ab and whaddya know, I installed a female snap in the Han snap place using a split rivet. No, really. My Han snap is a split rivet. So just follow that lower half curve into the upper half. Trim that bottom cover strip like I marked up. Most people will have the cover strips not only trimmed to the edge, but will clip the corners off at a 45-degree angle. 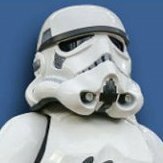 As for coverstrips not adhering 100% to the armor in some spots, no, that will not be noticeable while trooping- I wouldn’t worry about that. If it’s really bothering you in some spots, just pull it off, add more E6000 and use extra clamps and magnets the second go-around. Gotcha. Thanks, Matt! Yeah, the wrist ends of my forearm cover strips aren't even or rounded off yet because I'll likely be taking more off the whole end. Just wanted to get them assembled first. I already trimmed one bump off and the length seems good, I just need to even it all out on a belt sander. I like that trim line at the elbow end of the forearm. Would you give that end of the cover strip 45° tapers, too? Thanks, Rat! It'll be truly glam eventually. So his edges are vertical, yes, but at the cost of being not quite to the "bend" in the calf, which is where I'm afraid I'd be even if I got a new one. For the cover strips, you are fine. No one will notice them usless they use a teloscope, microscope, or some other kind of scope.